Every time I want to print some PDF documents, I'd like to put at least two pages of the PDF onto a single sheet to save papers. Now here comes the problem: many PDF documents have very large margins, and these empty spaces make the final printed content have very small font size, which is not comfortable for reading. Unlike Microsoft Word documents, which have many editors to reset the margin space for printing, most PDFs are not editable. But for PDFs, there are several free and open source tools for removing margins. A simple cross-platform application for cropping PDF files. A simple user interface lets you define exactly the crop-region by fitting a rectangle on the visually overlaid pages. This one is very similar to Briss, you can see all pages together in stacked view to find the right content rectangle. It can also run online as a Java applet. 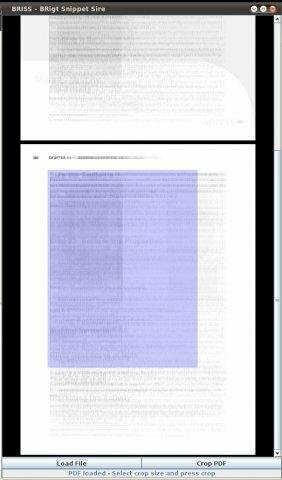 K2pdfopt optimizes PDF/DJVU files for mobile e-readers (e.g. the Kindle) and smartphones. It works well on multi-column PDF/DJVU files and can re-flow text even on scanned PDF files. It can also be used as a general PDF copying/cropping/re-sizing/OCR-ing manipulation tool. It can generate native or bitmapped PDF output, with an optional OCR layer. There are downloads for MS Windows, Mac OSX, and Linux. Both Briss and PDF Scissors require Java. If you're using a public PC where Java is not available, you can try this one. K2pdfopt has many functions for converting PDF to view on e-readers, but for printing purpose conversions, all you need is to change the "Conversion Mode:" to "crop" and leave all other setting as default - the tool will remove the empty spaces automatically.